(APN) BROOKHAVEN — Less than three years old, the newly formed City of Brookhaven, Georgia, is already plagued with transparency problems. A female city employee claims Mayor J. Max Davis sexually harassed her when he sprayed her buttocks with Lysol. Tom Kurrie, the City Attorney, tried to cover up the incident by altering public documents. As previously reported by Atlanta Progressive News, Davis is currently a candidate in the State House District 80 Special Election for State Rep. Mike Jacobs’s (R-Brookhaven) former seat. Three other candidates are running in the Special Election. They are Catherine Bernard (R), Loren Collins (R) and Taylor Bennett (D). Davis and Kurrie both denied there was a complaint filed by anyone alleging sexual harassment made against the Mayor. The Lysol incident occurred on February 23, 2015. 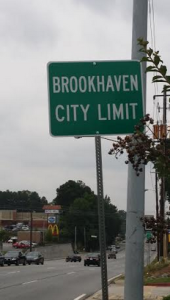 Two female Brookhaven city employees verbally reported the incident to City Manager, Marie Garrett. The city employee, who was allegedly sprayed, claimed she was embarrassed and humiliated by the Mayor’s inappropriate action and considered it to be sexual harassment. Garrett emailed a sexual harassment report to Human Rights Director, Rick Stone. The woman, whose buttocks were allegedly sprayed with Lysol, resigned at the end of March. The other employee who reported the incident, Fazillette Gonzalez, Executive Assistant to City Manager Garrett, witnessed the incident and has filed a related complaint with the federal Equal Employment Opportunity Commission (EEOC) on April 24, 2015. Gonzalez claims that Davis threatened her employment and tried to intimidate and coerce her into changing her witness statement to reflect that the incident did not involve sexual harassment. Gonzalez, following advice from her lawyer, recorded conversations between herself, Kurrie, and Stone, as well as, the alleged retaliatory conversation between herself and Davis, according to the Brookhaven Post online news service. To make the situation worse, Kurrie altered the report and resisted releasing the open records involving allegations of sexual harassment to news media. The documents were only released after the Brookhaven Post threatened to file a complaint with the Attorney General. Brookhaven Councilman John Park (District 2) stated, in the Post, that he believe that violated Title 45, Chapter 11, Section 1 of the Georgia Code because the document was altered and several paragraphs were missing. Kurrie resigned June 16, 2015 stating that he no longer had the support of the new mayor and the newest council members. Mayor Davis announced his resignation on May 28, 2015 to run for the Georgia House of Representatives seat in District 80, which includes parts of Sandy Springs in Fulton and Brookhaven in DeKalb. By Brookhaven City Charter, Rebecca Chase Williams, the Mayor Pro Tem and then-District 1 Councilmember, became the Mayor at that time. Williams appointed resident Linley Jones to represent District 1. The Council appointed Councilman Bates Mattison (District 3) to serve as Mayor Pro Tem. “Mike Jacobs called me and said he was thinking about being a judge, and would I run for this seat? He was concerned who might take over that seat. My term as Mayor would have expired in November, so I had to resign to run,” former Mayor Davis told Atlanta Progressive News. This may be technically true, but it also may be splitting hairs. A complaint has been filed with EEOC against the City of Brookhaven in connection to the Lysol incident, although focusing on retaliation claims. Davis has been accused of sexual harassment in a report to the City Manager, but it is uncertain if a complaint of sexual harassment has been formally filed, at this time. Aside from Davis’s future political ambitions, this case opens up the question of transparency in the newly formed cities. Opponents of cityhood wonder how more layers of government will improve transparency, especially, since other newly formed city governments are not without their own ethical challenges. “One of the primary reasons these cities formed was to improve transparency and that has definitely not been born out by the way these cities have behaved,” Marjorie Hall Snook, Board Member, DeKalb Strong, told Atlanta Progressive News. “When you create a new city you do not get rid of a single corrupt DeKalb County Commissioner, they are still there. What you are doing is hiring a bunch of new politicians. You do not solve the problem of corruption by adding more politicians,” Snook said. “The cover-up that occurred is real evidence of the kind of problems that can occur in these small cities. The city attorney photoshopping documents of public records to hide information that is embarrassing to the Mayor is a massive red flag,” Snook said. “This is evidence that creation of a city does not reduce corruption, but it just creates more opportunities for corruption,” Snook told APN. DeKalb Strong is a growing movement that believes the current rush to cityhood is bad policy with have huge negative consequences for schools, quality of life, and taxes in all of DeKalb County. Perhaps the Brookhaven, GA police should learn how to investigate political corruption than learning how to repress subjugated populations from Zionists occupying Palestine.